In Massachusetts, there is no law protecting first responders from asking for counseling and no law promising confidentiality. As a result, firefighters often don’t ask for help. 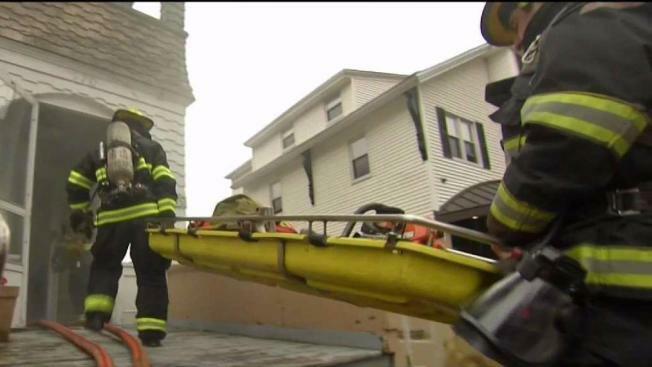 Firefighters across the country and in Massachusetts are struggling with mental health issues and post-traumatic stress disorder (PTSD), according to a study where NBC-owned stations partnered with the International Association of Firefighters to anonymously survey firefighters. The groundbreaking survey gives insight into the everyday challenges facing firefighters. Long-time Worcester, Massachusetts firefighters talked openly with the NBC10 Boston Investigators about the 1999 Cold Storage Warehouse fire, a subject which few have spoken about publicly. That is part of the issue and now, 18 years later, they face it head-on. The Parkland, Florida school shooting had the nation gripped with emotions of grief and anger. The focus was initially on the families of the 17 killed and the mental health of the shooter. Unseen was the emotional toll on first responders. The Worcester firefighters know personally the toll of what they are going through in Florida. NBC10 Boston spoke with Lavoie, and two other 30-year Worcester Fire Dept. veterans. All three were at the Cold Storage Warehouse fire in 1999 when their department lost six firefighters. They shared their struggles in the years that followed. “I didn’t know what was going on. Depression, anxiety, I was a mess," Lavoie said. He finally called a counselor for help, but did so from the fire station parking lot so nobody would hear him. “When the Worcester Cold Storage comes up my blood gets hot, face gets hot," deputy chief John Sullivan said. "There is a real visceral reaction”. Born in part from that tragedy, Worcester is pro-active by encouraging peer support led by Lt. Steve Oberg. They are now teaching new recruits not only firefighting, but how to mentally cope. One training is how to find a firefighter down, just like the Cold Storage fire. Sullivan lost two on his crew at that 1999 fire. “I’m in a club I don’t want to belong to. I was an officer who lost men in the line of duty under his command,” Sullivan said. New recruits get a strong message on day one. NBC-owned stations partnered with the top firefighters union to survey its members about their mental health. “Having 7000 firefighters respond to this survey shows how important this issue is to our members and how many of them out there are suffering,” Jeff Brinkley with the International Association of Firefighters said. Firefighters in the survey say they are stressed and ashamed to ask for help or don’t know where to turn. “There’s such a lack of services out there and where they do exist the firefighters don’t trust it,” Brinkley said. The survey revealed that 78-percent of the firefighters said their department failed to educate them about behavioral health. Sixty-three percent said their existing employee assistance program is not much use; 77-percent of the firefighters said peer to peer support is helpful. "Firefighters want to talk to firefighters," Lavoie said. "Fifteen years ago I didn’t know anything about PTS or PTSD”. A bill that would require counseling to remain confidential is stuck at the Statehouse for the third year in a row. If you know of a firefighter that needs help click here for resources.